Incredible snow and wonderful views help make Brunico one of Italy’s most successful ski villages, where there is access to 978km of downhill skiing for all abilities. A lift pass will also take visitors to a host of other resorts in the Dolomites, including Arabba, Civetta and Corvara. There is a selection of fantastic activities to enjoy across the village, along with some incredible facilities and accommodation. What’s more, there’s the beautiful medieval town of La Citta vecchia di Brunico, where amazing architecture awaits, such as the Gothic Town Hall and the Multscher Museum. For budding photographers, some amazing views can be enjoyed in this wonderful region of Italy, overlooking the extraordinary Dolomites mountain range. The season runs from December to April and there are snowmaking facilities available to ensure skiers can take advantage of pristine coverage. 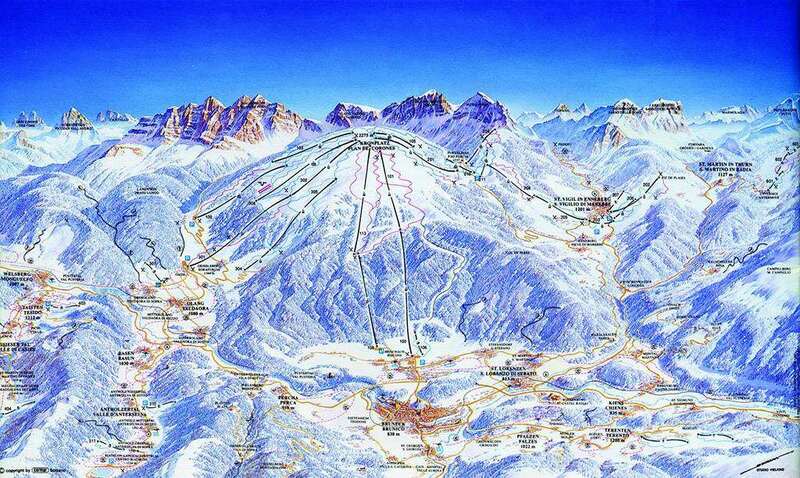 The main ski area is the Kronplatz which is considered to be the best in the South Tyrol. The resort boasts state of the art lifts and has excellent slope grooming. The majority of slopes are suited to beginners, making it an ideal destination for families. However, for advanced skiers there are some more challenging pistes. For experts, Reischach is arguably the best option, with two slopes that stretch for over 5km and reach as high as 1,300m. Olang and San Vigilio also have routes that are 6km in length with a 1,000m descent. There is a selection of huts across the resort to enjoy a relaxing drink after a day on the snow. Whether you want a peaceful atmosphere in typical Tyrolean pubs, jaw-dropping terrace views or trendy bars, there is plenty to look forward to. Alp Hut Huber and Alp Oberegger provide a sensational atmosphere and excellent cuisine, making them fantastic places to mingle with fellow skiers. However, if you’re after some first-class Italian food, there is nowhere better than Gassl Pizzeria. Venice is the best airport for your Brunico ski trip, with transfers available by road or train.